The phantom editor strikes again! Don’t miss the brilliant commentary. This is a very interesting and professionally edited take on ATTACK OF THE CLONES. “As before, I do not wish this to be viewed as an attack on the motion picture industry, an allegiance with motion picture piracy or even an attack on artist’s right. My “proactive criticism” is aimed only at one filmmaker – George Lucas. So please let the entire contents of the DVD serve as my proactive criticism of where I feel George Lucas has gone off page – not only with the storytelling integrity of this film, but the integrity of a beloved piece of film history. 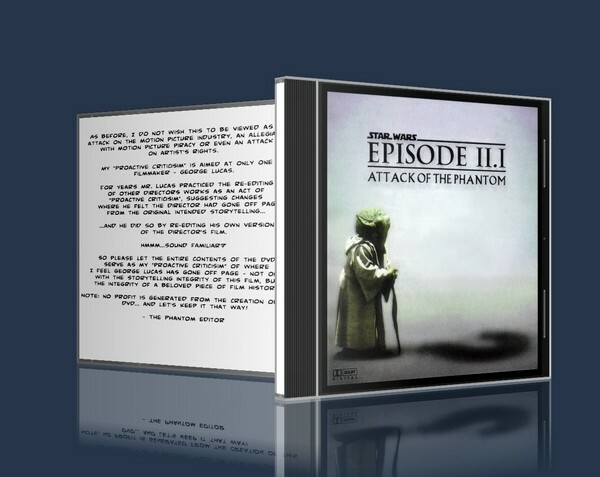 Note: no profit is generated from the creation of this DVD … And let’s keep it that way! “This is an amazing DVD. Technically sound. Dolby digital. Commentary track and “infinifilm” extras. Even some scene changes and rotoscoping – WAY more advanced than the Episode I cut, which was essentially a cut of the film that lasted maybe an hour. Clearly there was a lot of thought put into this edited version of Lucas’ film. This isn’t just cutting out characters he didn’t like, but really looking at the psychology of the characters and the telling of the core story. The audience seems to be his primary concern. I think it you watched it, you might be surprised at some of the insights the Phantom makes on the film. It is easy to criticize Star Wars films. It is another thing altogether to recut the entire movie. He starts out by deleting Captain Typho’s “I think we’re safe” line from the beginning of the film. The Phantom calls it an Friday the 13th moment. If you click the phantom logo that pops up, you can hear an expanded commentary with clips from the horror movies as well. If you remember the Phantom Edit of Episode I, it was most memorable for removing Jar Jar from the film. Well, this isn’t simply cutting a character from the film. Jar Jar is in the film! But several of his scenes are cut down to remove his dialogue, to make the audience feel that he has grown up. “Use him with value” and to help the audience “feel he is intelligent” and that he knows what he is doing. There were a series of cuts soon after, like Anakin nose dive in chase scene and his weird laughing, the irreverent power couplings scene and other awkward humor lines. In one instance the Phantom even moved ambience sound to rear channels in night club scene. One of the most aggressive cuts was the entire Kamino dart subplot – all of the robot analysis scenes are cut along with Dexter Jettster because a simple “Kamino system” line has been added to the Zam Wessel death scene. He also chose to cut the Yoda and the Younglings scene out of the film, feeling it hurt the Obi-Wan character. Alliance. He was ahead of his time, perhaps falsely motivated, but in the end was correct. He talks about the sound design being flawed, like when Anakin and Padme are entering the Genosian the audience can hear the enemies before the Jedi senses it. He changes the sound design so that the Jedi reveals to the audience the problem. He also added in new sound effects and reedited the droid sequence entirely. He didn’t like the R2-D2 jets but in the end couldn’t get away from them. He felt it was a problem for Lucas, so he invented a new tool for R2 to have. Why doesn’t he have them later in the Classic films? One change I really did like was the fact that the Phantom redid the subtitles in places – the best one being the Death Star cameo. He took away the “duh” moment for the audience, as if you couldn’t see it was the Death Star in the earlier two shots. In the end, the Phantom Editor makes some great points and defends them well in the commentary. Some people just whine about not liking the films, and this guy takes a step at trying his best to “correct” them. 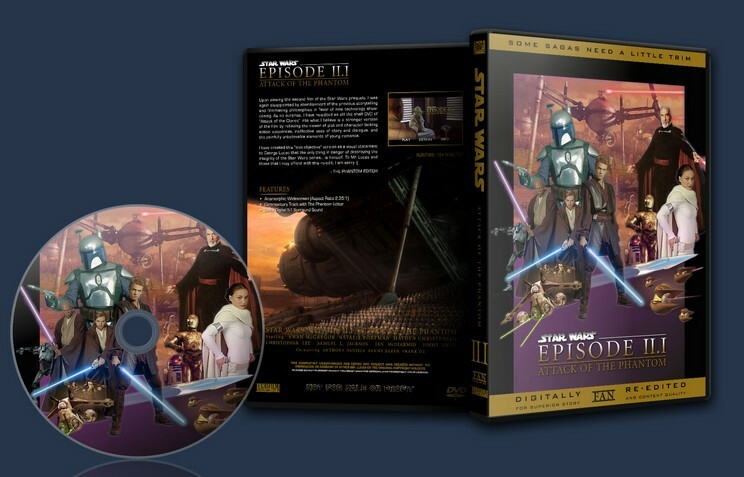 Regardless of your opinion of the second prequel, you owe it to yourself to track down this DVD and see for yourself all of the changes and weigh in if indeed it does improve the movie. The Phantom Editor did a spectacular job with this edit, while his first one isn't that good, this one improves the film SO MUCH. Many of the cuts are very subtle and contribute to actual character development and storytelling. The Phantom Editor truly understands characters and storytelling, the romance is handled perfectly and I highly recommend listening to his commentary track which is very in-depth and laid out in an intriguing way. Many things about the movie that I hate were still left in but in the end, this edit is one of the few that fixes storytelling and character development. Wow, The Phantom Editor is a legend in the world of fan editing, and deservedly so. The fact that you changed the worst Star Wars movie of all time into a good movie is like magic. I listened to the commentary and it has helped me to become a better editor. Your pure skill at analyzing a movie down to the individual shots is breathtaking. This is a genius edit because it is the best of both worlds between fan editing (cutting out parts you don't like) and fan re editing (re editing the film). You cut a lot out whilst still retaining great narrative, and I actually liked Anakin Skywalker (MOST OF THE TIME). talking. Great job until that last little bit when he still gives her that creepy look. Same thing on the balcony, its great until he touched her up; the creepy vibe is reduced but still there (But the transition just after the kiss was great). The edits on Tatooine make it the best thing in the entire movie, but I still think that the sand people slaying is incredibly psychotic. You should have either cut him killing the sand people entirely and just had him coming home with a corpse (and also getting rid of the garage scene) or just cut him saying he killed the women and children. The editing was fantastic most of the time, but there was 1 cut which seemed out of place. This was when Anakin is talking to Jar Jar, and then the next shot Obi Wan appears in the frame. I know you couldn't really help this, but you said in the commentary you had alot of advanced equipment such as After Effects and etc, so you could have found a way to make that work. I need to also point out that the new Phantom Menace music cues worked very well and not only increased the quality of the score but also gave a sense of continuity. The last thing I have to say is I really think the Yoda lightsaber fight should have been left out. You have done a splendid job with this so I can only really point to negative things. It a fantastic edit and I thoroughly enjoyed it. The Phantom Editor you are a genius. Old fanedit, quality is bad. Editing was good. Movie was still bad, but much better than the theatrical. The commentary was better than the first one, but the amount of “film school douchebaggery” was annoying to me. Bonuses and easter eggs were both cool and lame.